They called the Permian Basin the mother of all busts and buried it three decades ago – but judging from the four oil stocks to buy we're sharing today, that funeral may have been a little premature. But first, back to the so-called bust back in 1983. Thanks to an oil glut, the market crash of 1982, and a downturn that chased most of the major energy companies out of the region, banks closed up shop and one-time oil barons became car salesmen. Oil fields turned to cotton farms, and oil rigs were left to rust. "In 1983, they thought the oil industry in Texas was done," recalls Doug Robison, president of the Permian Basin Petroleum Association. Oil was discovered in the Permian Basin by accident. Ranchers and farmers seeking water often struck oil instead. Commercial oil wells were first drilled in 1921, and the Texas oil boom was on. Ranchers and farmers sold their land to energy companies. Wildcatters drilled in every promising spot along a 300-mile swath that stretched through Texas and New Mexico. The price of oil, which had inched up to $34 in 1980, fell to $10 within four years due to rising supplies and falling demand. New federal environmental regulations, such as the Clean Air Act, made drilling and processing oil more costly. Capital for oil exploration and extraction dried up. Drilling collapsed. Jobs disappeared. It would be almost two decades before the black gold began flowing from the Permian Basin again. According to the U.S. Energy Information Agency (EIA), the rock formations in the Permian Basin differ from most other potential oil fields in that oil-bearing rocks are stacked in layers. Because of that, conventional, older vertical wells were inefficient at extracting the oil, and traditional techniques could only pump a fraction of the oil. It took the invention of hydraulic fracturing, or fracking, which uses water, sand, and chemicals forced into horizontally drilled wells under high pressure to extract "tight" oil from rock, to make the Permian Basin a rich source of energy wealth once again. Today, 27% of all of the oil rigs in the United States are currently operating in the Permian Basin, the largest concentration of oil rigs anywhere in the world. Production has soared. The EIA says the basin produced 1.35 million barrels of oil per day in 2013. That could double within the next 10 years, say analysts at ITG Investment Research, while the Permian Basin Petroleum Association believes that figure could come close to tripling. 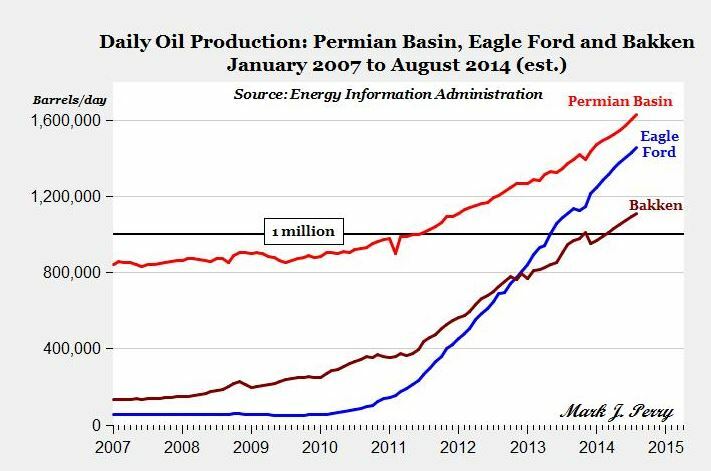 That skyrocketing crude oil production has pushed the Permian Basin to the top position as the leading oil producer in the country, outpacing both the Eagle Ford (also in Texas) and the Bakken (primarily in North Dakota). The Permian Basin's potential seems almost limitless. And here's how investors should play it.